Skyhawk Making Metal | Tennessee Aircraft Services, Inc.
During a scheduled inspection, such as an annual or 100 hour, owners often have mixed emotions. On one hand they hope nothing is found and may even joke with the mechanic to not look too hard. On the other hand, that same owner would never want a safety related issue missed. We all dread that call from the inspecting mechanic to inform us “we found corrosion” or “you have a burned exhaust valve” or worse, “we found metal in the oil filter”. The regulations allow an inspector to use pretty much any checklist for an annual inspection, even one of their own making provided it covers the minimum as described above. Our subject airplane is a 1977 Cessna 172 which is equipped with a Lycoming O-320 engine. The 172 service manual section 2 for “Ground Handling, Servicing, Cleaning, Lubrication, and Inspection” includes the Cessna recommended inspection checklist. The first line of the Engine inspection list calls to look at the “Engine oil, screen, filler cap, dipstick, drain plug, and external filter element.” So, regardless which checklist is used, ALL the oil screens/filters must be inspected for debris. One can’t properly do that if one doesn’t know they exist or where they are. We have discovered that many mechanics are not aware that the Lycoming engines have a screen in the oil sump. It is a very coarse screen designed to catch large chunks of debris before they get to the oil pump. If the screen isn’t checked, debris can build up and restrict oil flow to the pump. Obviously, undetected debris wouldn’t alert you to potentially serious problems in the engine. To find where all these screens are, one would most likely first check the 172 service manual. Section 11 of the service manual is for Engine, and paragraph 11-13 for inspection states: “For specific items to be inspected, refer to the engine manufacturer’s manual.” So, we’ll go find Lycoming’s manual. The engine oil flow diagram is found in the Lycoming Direct Drive Overhaul Manual. Figure 2-3 shows the oil flow starts in the sump and passes through the oil suction screen in the bottom of the sump first, then on to the oil pump gears, which is followed by the oil cooler and then the full flow filter. The Lycoming Illustrated Parts Catalog for our O-320 engine shows the sump screen is held in place with a large cap mounted at the rear of the sump. Finding scrap metal in the suction screen is just like finding metal in the main filter, it’s just a lot easier to see. Finding metal in either usually initiates a sequence of emotions that begins with shock, followed by disbelief, followed by depression, followed by…. well, it really doesn’t matter after that. Patience and due diligence are the key at this stage. Some guidance is needed to determine at what point metal in the screen should cause alarm. Lycoming publishes all their bulletins in pdf format on their website at www.lycoming.textron.com, so we’ll start there. It will take some scrolling through Lycoming’s list, but you’ll eventually get to service bulletin 480E which specifically addresses oil screen inspection as part of the primary subject. Unfortunately, it only discusses when the screen should be inspected and to watch out for excessive or abnormal amounts of metal particles. It never defines what Lycoming considers excessive or abnormal. If you read through all of Lycoming’s service bulletins, service letters, and service instructions, you’ll eventually find service instruction 1492D which addresses piston pin plug wear. After it explains pin plug wear it also defines excessive and abnormal debris in the oil screen. Debris is broken down into specifics about size and quantity, so there is far less guess work on the mechanic’s part. Our subject engine has a couple of tablespoons of VERY large parts found in the screen. Large enough that we almost expect to find the proverbial “part number” stamped on one of them. All the pieces are aluminum with one small steel wire. With this many large pieces we expect an easy time determining the source. Of course, if it were easy or common, I wouldn’t bother writing this for you to read. We examined the pieces and noted several had a curved shape. Our first thought was a piston skirt so we borescoped all four cylinders. Lateral scratches on the cylinder walls could indicate broken piston rings or some problem with a piston which could lead us to the offending part. Unfortunately, all the cylinders looked perfect so we decided to remove the two left cylinders for an exploratory look at all the pistons and most of the rest of the core engine. We still found absolutely no evidence of any missing pieces or scarring from loose parts flailing around. Still not convinced the engine is mortally wounded, it was decided to remove the magnetos and snoop around inside the accessory housing with the borescope. Nothing! All the gears looked about normal for the time on the engine, and there was no indication that any wholesale quantity of aluminum was missing. Now we’re emboldened with uncontrolled curiosity that requires we remove the accessory housing so we can see the only two areas not yet visible: the oil pump gears and the bottom of the oil sump. The accessory housing comes off, exposing the oil sump so we can clearly see at least as much loose aluminum chunks sitting in the bottom as we originally found in the screen. One of the pieces was huge in oil sump debris terms. 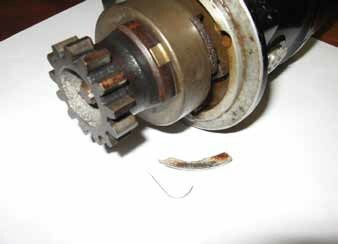 With all this material, something had to have made its way into the oil pump. The oil pump is attached inside the accessory housing with just three nuts. The nuts were removed and the cover lifted….. again nothing! The pump and gears looked perfect, not even scratches or any clue that anything other than good clean oil had ever gone through it. Now this is getting bizarre. When we find metal in a filter, the phrase often used is that the engine is “making metal.” When thinking rationally, we all understand that our engines can’t “make metal.” Anything found in a filter or screen must be a loss of metal. This little engine was beginning to challenge my mental state until we piled all the parts from the screen with the parts found in the sump. That really big piece from the bottom of the sump had a strangely familiar shape; slightly curved but thick with rounded edges. It had to be part of the boss of a magneto. A quick look at both magnetos showed nothing missing but did show a perfect match to the shape of the biggest debris chunk. Now the lone little wire makes sense. It’s part of a spring from a magneto impulse coupling. The single impulse coupling mounted to the left magneto is checked and found fully intact. Now what? I vaguely recall a children’s book I read in grade school about The Wheel on the School. It had something to do with wagon wheels on top of houses for storks to nest on. The little school house didn’t have a wagon wheel, so the children and community were challenged to find one. They were told to look anywhere a wheel could be, couldn’t be, or couldn’t possibly be. I’m sure I’ve not recalled the details of the book correctly, but the idea about how to look for things stuck with me. The one place we haven’t looked for the source of our extra metal is in the maintenance records. Some reading revealed the left magneto had been replaced about four years before. There was no explanation of why, and no indication that any other work was done at the same ime. We speculate that the magneto failed in such a way that the impulse coupling rubbed on the magneto case mounting base, partially machining it to the point of failure. At the same time the impulse coupling came apart. A lot of pieces and parts fell down into the oil sump. How they didn’t get caught in all the other gears we can’t quite figure out. It’s probably that the mechanic fished out all the pieces he/she could with a magnet but determined whatever was left wouldn’t cause any harm. As much as I hate to admit it, four years and a couple hundred flight hours indicates he/she was correct. Never the less, it was a terrible chance to take with other people’s lives. We are now fully satisfied there is no harm to the engine. In fact, we’ve been able to visually inspect the camshaft lobes, cam followers, all accessory gears, oil pump, exhaust valves and the inside of the pistons and find them in excellent shape. Everything gets a good cleaning, new piston rings installed, cylinder walls de-glazed and all is reassembled. I certainly wouldn’t expect a similar scenario next time, but a proper investigation into the source and cause of the loose metal is just due diligence. 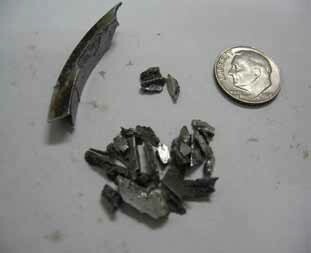 Pulling an engine at first site of metal in the screen or filter is not the proper response. The same can be said for a single bad oil analysis report. Lycoming’s SI1492D calls for the same measured approach to the situation. A significant amount of labor was expended, so you might ask why not just pull the engine for overhaul and eliminate any possibility of a problem. The engine was in otherwise good condition and should have lots of life remaining. Our opportunity to get a detailed inspection of the insides added even more confidence to the long term viability of the engine. I’m a firm believer that less maintenance is better when possible. In medicine it would be called “evidence based” and in mechanical realms we call it “reliability centered.” We want to be focused in our troubleshooting and have a defendable logic for the actions we take. The trick is to understand the systems and be aware of how far to go before pulling the proverbial plug. © Copyright 2019 - Tennessee Aircraft Services, Inc..